Invite Linda to narrate a bed-turning for your guild event or quilt show. What is a bed turning? Quilts of all types and styles, antique, vintage or newly made, are placed one on top of the other on a "bed." As each quilt is turned back, the quilt is revealed and its history, pattern or other interesting information is described. 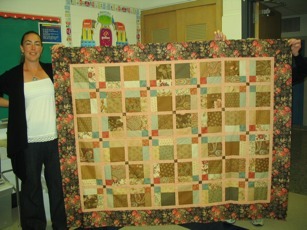 The quilts may come from guild members, the community, or Linda may bring some. This is an interesting and popular way to show a variety of quilts and styles of quiltmaking. Linda will give as much information about the quilts your members bring to this lecture as possible. She may be able to tell the pattern name, age of the quilt, types of fabrics in it and other interesting information. It is fun for everyone to learn about these treasured quilts, although sometimes a quilt may remain a mystery. More patterns for using 5" squares to best advantage. Many patterns and examples are included. What do judges look for when awarding ribbons? As a quilt show judge, Linda has many suggestions for improving your quilts, and your chances for winning that ribbon. This information is helpful to all quilters, even those not interested in entering a show or having a quilt judged. 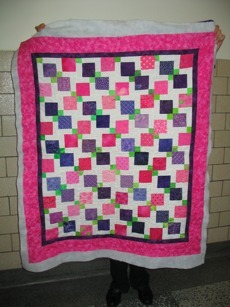 Linda will bring several quilts as examples of positive, and sometimes negative, situations found in quilt making. This is an informative lecture for quilters who are interested in improving their skills. Lecture which includes information on making patchwork and applique borders fit a quilt (sometimes without the math) and complement the design. The types of borders which are possible and how to measure for borders is covered. 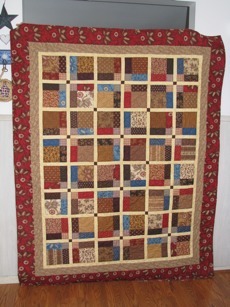 Linda will bring a variety of quilts to illustrate many possible border designs. Linda will show a variety of antique fabric samples and current fabrics, as well as quilts from several eras to illustrate reproduction fabrics and their origins. Some reproduction fabrics have been available for over 100 years. Lecture includes a look at the interesting origins of redwork and the path it has taken to present-day quiltmaking. Enjoy viewing some examples of redwork and a variety of patterns and fabrics used in this technique. Meanings of many flowers and folklore concerning the origin of the flowers' symbolism are a part of the lecture. A selection of floral quilts will accompany this interesting narrative. A variety of quilts, antique and contemporary, will act as the vehicles for this journey through the history of our country. Included in the lecture are historical facts, names of quilt patterns, patchwork and applique designs and various types of quilts. A lecture/demonstration showing a variety of scrap quilts that utilize five inch squares for their patchwork designs. We all have many scraps, and very often collections of five inch squares, which have been sold as samples from fabric companies or traded among friends. These quilt patterns use the squares in the most economical way possible with very little waste. What is a Quilt Appraisal? Copyright © 2000-2016 Linda Hunter, all rights reserved.